Customer preferences and regulatory requirements change so rapidly that only a fully digitalized lab can keep up. With such a lab, CPG companies can be confident in their ability to deliver quality products that keep pace with what customers want and regulators demand. There are over 7 billion people on the planet, each with their own desires and needs. But there is a common thread that binds large consumer groups in major CPG markets around the world. From the family of five in the suburbs of greater Los Angeles to the trend-chasing teenager in Tokyo and the couple enjoying their retirement in São Paulo, they all want to be sure that the products they consume every day are authentic, of high quality and – above all – safe. Beyond product safety, consumers across the board also want reliable products of consistent quality that are sustainably made and reasonably priced within its product segment. From a Nielsen survey, 70% of consumers globally are willing to pay a premium for “green” products. At the same time, 61% of consumers are dissatisfied with current product line standards and variety across a wide range of CPG categories (Nielsen). A key challenge in the CPG sector is the need to ensure that quality and compliance standards are maintained at the highest levels while being agile enough to meet consumers’ ever increasing demands, not to mention rising expectations. The cost of a misstep is high. A single product recall or viral negative review can be catastrophic to a brand. With increased product segmentation, stiffer competition and ever-evolving consumer trends, manufacturers have to stay at the peak of their game. But it’s not just the customers who call the shots – product-related regulations also change over time and across borders. So how can you be sure that you can keep up with both customers’ and regulators’ expectations – or better yet, exceed them? Many labs still employ legacy solutions that rely on paperwork and manual processes. This may have been sufficient in the past, but as the pace of business increases, it’s time to evolve to more efficient methods. Imagine having all the data from every lab on your network, right at your fingertips. Imagine accurately predicting formulation performance with data modelling. Imagine being able to innovate products faster with virtual experiments. Imagine having total confidence within your reach. In many parts of the world, there is an upward trend in consumer financial stability and an increased willingness to trade up CPG purchases. Your executives know the truth: when it comes to capitalizing on consumer trends, speed is of the essence. But when consumer sentiment is compiled in with scattered, incomplete data sets, how can your executives know what trends to push through? And even if they do know, can they get a product to market fast enough to make a meaningful impact, without compromising on quality and compliance. The typical lab faces multiple challenges. Disaggregated data is a major one – sifting through it manually is time-consuming, reducing the chances of being able to quickly and accurately respond to consumer sentiment. This, compounded with increasingly complex regulatory requirements, causes critical delays in time-to-market. The digitalized lab moves confidently faster and is well-positioned to quickly deliver innovative, valuable products to consumers. How does it do this? By connecting an entire network of lab systems, it is able to streamline information from every lab’s equipment, inventory, chemical component directory and physical experiment database. This enhances research, development and product lifecycle management. Knowledge is power. When you have all the information you need at your fingertips, confidence in your lab processes comes easy. The higher the stakes, the harder it is to guarantee confidence. Our solution provides your labs with the means to attain true connectivity across the entire network. 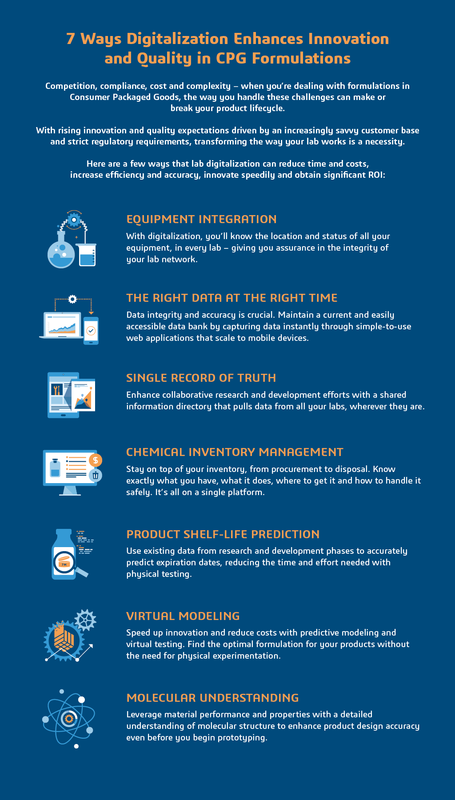 With a seamless flow of information, labs can move faster from chemical compound procurement to product shelf-life prediction, thus accelerating innovation and improving quality. The digitalized lab elevates your existing capabilities to greater heights. Experience the ease of delivering quality with digital continuity, centralized data, virtual testing, streamlined processes and data integrity. This is your chance to erase all doubt. Be sure. When a global food and beverage company wanted to increase its competitive edge through better innovation and collaboration, it turned to Dassault Systèmes' BIOVIA Notebook. The solution replaced paper notebook research documentation for the company’s global network. "We needed something that a chef, a scientist and an engineer could use, as well as something that their managers could sign and witness. The BIOVIA Notebook offers a clean, user-friendly interface with an electronic "blank slate" that mimics a lab notebook page."